Wood Bison are the largest native North American land mammal and they are 20% larger than Plains Bison. 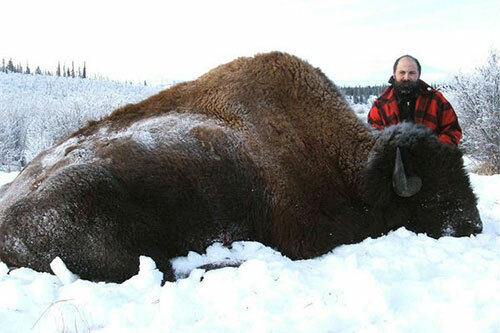 A Wood Bison bull can easily weigh in excess of 2200 pounds. Although they are similar looking to a plains bison there are some differences that makes them unique. They have a larger, taller, more pronounced hump that is further forward than the hump on a plains bison. (Plains bison have a comparatively rounded back.) Wood Bison also have shorter hair on their brisket and a little longer and more heavily haired tail than a plains bison. In the winter the bison can not “paw” at the snow the way that a horse can. Therefore they swing their huge head to the move or “nuzzle” the snow away from the grass. This area is not a deep snow area and therefore the bison are able to “rustle” in the sedge meadows along the lakeshore or they will move and eat the grass on the dry windswept slopes and ridges either above or below timberline. 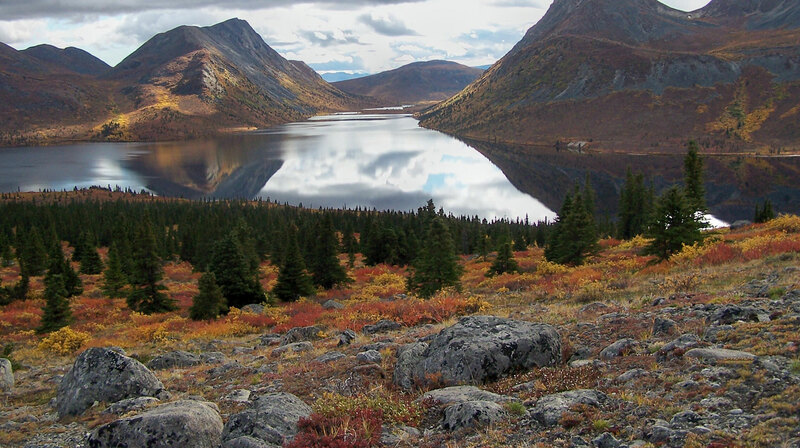 Our area is the only area in the Yukon that has Wild Wood Bison. They are entirely free roaming and they are truly wild. 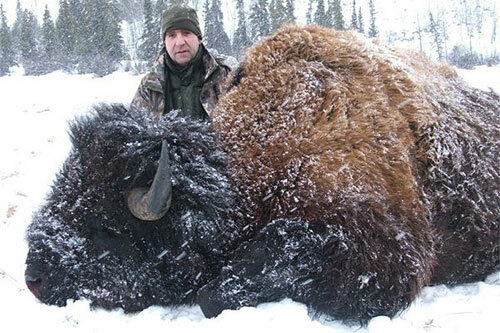 A bison hunt in the Yukon is not like shooting cows in a pasture! Our success rates have been excellent but it is truly a hunt. 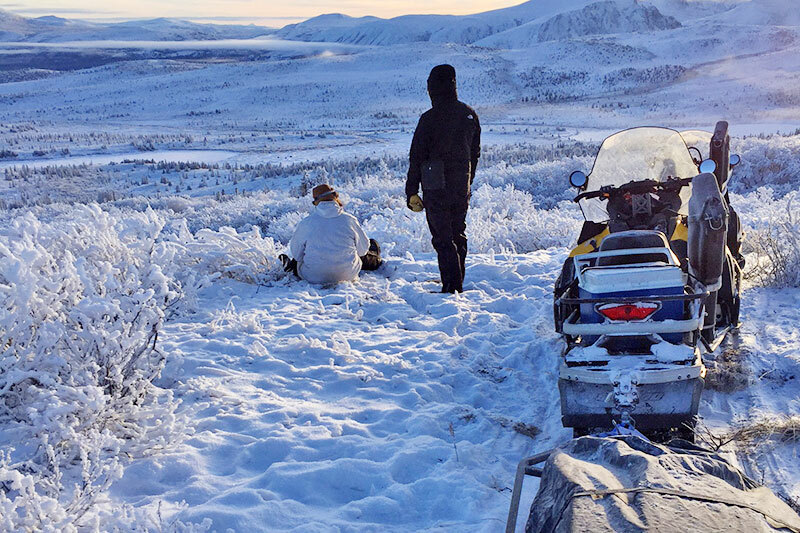 We normally stay in a cabin and we utilize snowmobiles during our bison hunts to access the bison and to recover the meat and trophy. The season starts in December for bulls or cows and continues through to the end of March. 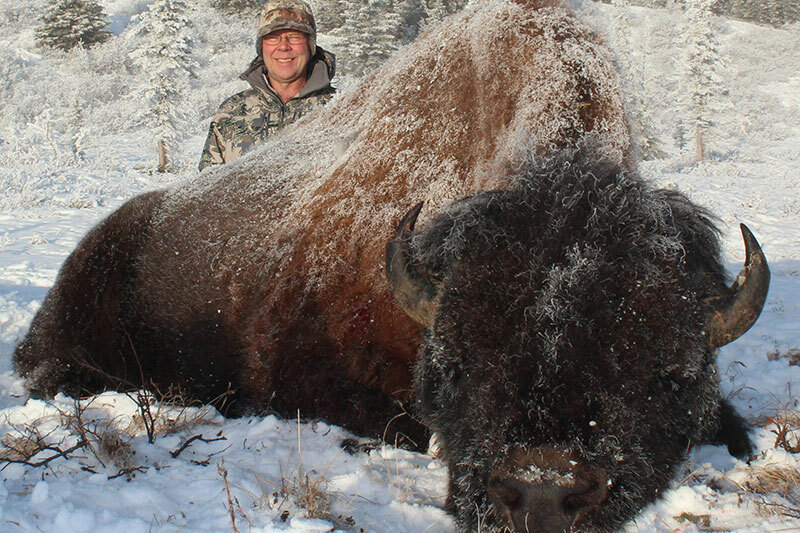 We have harvested some good bulls with our largest bulls scoring well into the Boone & Crockett record book including the world’s record bison (120 B&C) taken with a muzzleloader by Jim Shockey and several bulls taken with a rifle, which scored 122 B&C, or about #63 in the Boone and Crockett book.